As far as I'm concerned, creating this lantern satisfies three important Halloween criteria: 1.) It allows me to dress inanimate fruit in drag, 2.) It caters to the modern obsession with celebrity (the fact that said celebrity is dead and was a Roman Catholic is pure holiday gravy), and 3.) It gives an appropriate nod to the centuries-old tradition of warding off evil spirits. Of course, the only spirit a Jackie O. Lantern might ward off is that of Maria Callas. Or Christina Onassis. 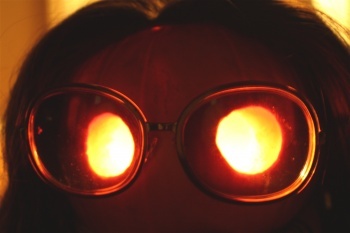 I Googled images of Jackie O. Lanterns and was shocked-- there weren't any. Yes, there were a few that called themselves Jackie O. Lanterns, but they were either just female jack-o-lanterns or, more dishearteningly, Jackie-o-lanterns wearing pink pillbox hats. And that's wrong, I tell you, just wrong. That pillbox hat-- that's not Jackie O., that's Jackie Kennedy at the moment of her first husband's death. I wanted to convey a more cynical Jackie (or practical, depending upon your point of view)-- I wanted the Jackie who cashed in her status as American royalty to marry an aging stallion/obscenely wealthy Greek shipping magnate in order to protect what was left of her family and garner unheard of shopping privileges. So I borrowed a wig, big sunglasses, and a scarf from my friend Natalie, who likes to play dress up more than any other adult I know, and tarted up a little sugar pumpkin. Big sunglasses. It's all about the sunglasses. A sugar pumpkin. (Note: take the sunglasses with you while pumpkin shopping. If the glasses fit around the pumpkin's girth, you've got your pumpkin. Some sort of carving instrument, like a small, sharp knife. 1. Cut out a lid on the top of the pumpkin at a 45 degree angle so that the lid will remain in place when pumpkin is hollowed. This opening should be just large enough to allow access to your clenched fist. The smaller the hands, the better. 2. Scoop out seeds and stringy bits of pulp from the inside of your pumpkin with a spoon, preferably made of sterling silver. It's even better if you are using a dessert spoon that has been stolen from the Plaza Hotel in New York. Since I have no such spoon, I had to settle for one I stole from the Algonquin Hotel instead. I am not advocating stealing-- I was just pretending I was Robert Benchley and was therefore necessarily pickled. Reserve the pumpkin seeds for later roasting, since the seeds of the sugar pumpkin are the best for toasting, which is something I learned from Elise Bauer's always helpful Simply Recipes. 4. Put your now-naked Jackie O. Lantern upon some sort of pedestal (I used one originally intended for cakes) which, now that I think of it, seems entirely appropriate. 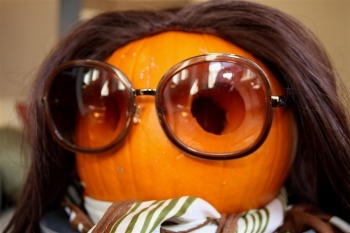 Dress up your pumpkin doll with wig, sunglasses, and a purely optional scarf-around-the-neck. Presto! You've got an international woman of glamour sitting on a cake stand in your kitchen. To add an inner glow to your Jackie O. Lantern, remove the wig and lid from the pumpkin, place a votive candle inside her, and light. Replace lid and wig. Adjust hairstyle, if the need or desire arises. For a delicious bit of added fun, summon the spirit of Aristotle Onassis with the help of your Ouija board. Once you have his full attention, blast a Maria Callas aria from your surround sound speakers, then sit back and feel the tension. Voi lo Sapete from Mascagni's Cavalleria Rusticana would do very nicely. I recommend hiding all valuable, breakable objects. That woman saw things that no woman should ever have to see.